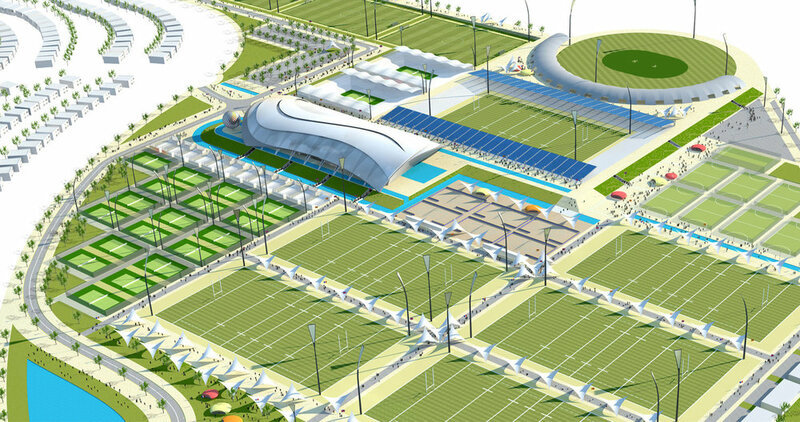 Developed as a feasibility project, the Murcia Sports Park was designed as a state of the art complex, to be one of the best in the world. The mix of indoor and outdoor facilities combined with an Olympic Village ethos and love of sport made the facility unique in size and scope of offer. The centre aimed to create a sporting environment that was hospitable to all users, regardless of ability, from world class athletes to grassroots beginners. Striking this balance in clientele involved developing flexible spaces such as a 50m Olympic pool with traversable boom to facilitate smaller training pools. The overriding design principles for the masterplan respond to the site conditions, paying particular attention to solar orientation. All pitches are orientated on a NW / SE axis (goal to goal). This avoids sport being played in the direction of the setting sun. The Hub at Murcia Sports Park is located centrally on the site on a raised platform to provide elevated views out over all sporting facilities. The Hub is the social centre of Murcia Sports Park and includes all central facilities. The Hub turns its back on the setting sun providing optimal viewing conditions for spectators. The canopy covering the Hub has been designed and orientated to provide maximum shading to the internal sports areas. It also creates covered promenades on each side of the building which provide comfortable relaxation spaces for spectators. Pedestrian routes are given priority throughout the sports park which is divided by a simple and legible ‘cross’ of pedestrian circulation forming connections between all areas of the sports park. Ribbons of water have been draped across the park with water features and fountains providing important focal points and cooling for spectators while tensile structures and strategic planting of trees provide high levels of shade to all public spaces and spectator areas. Further integrating sport into the DNA of the Sports Park, a 2.5km running and cycle circuit runs around the edge of scheme.